1 bedroom with loft sleeps 5 in the White Mountains. 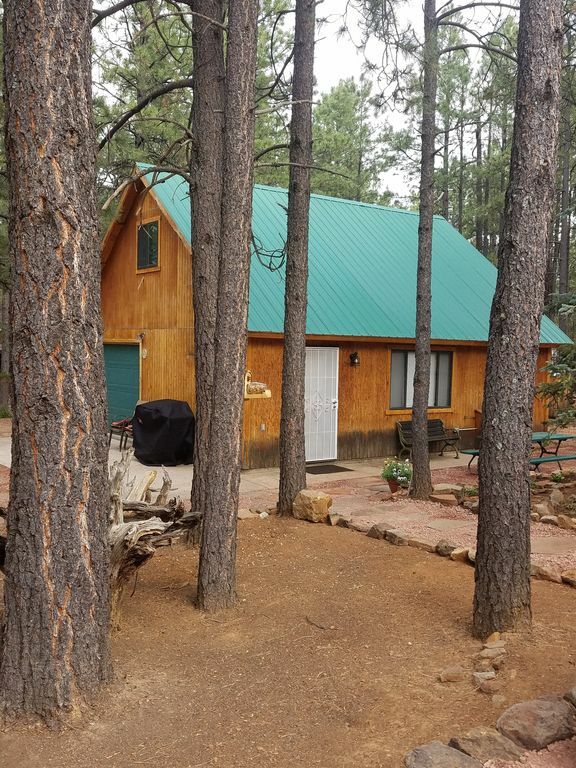 This property is nestled in the beautiful Mogollon Rim area of Arizona, just 35 minutes from Payson and 20 minutes from Heber. It's close proximity to Woods Canyon Lake, Willow Springs Lake, and Black Canyon Lake allows for fishing, kayaking, and boating. Bring your ATV's to enjoy the many riding trails. This bunkhouse is approx 1,000 sq feet and located next door to our main cabin. It features brand new kitchen & bath, new paint, and flooring (updated Mar. 2018). ** We are currently finishing the outdoor area, prices reflect the work in progress. More pictures to come in the next few weeks. ** Amenities listed below. * Dogs are allowed for additional $25/dog fee (2 dog max). NO CATS due to a significant allergy to cat dander. Property is not fenced. * Smoking allowed outside only. PENDING FIRE RESTRICTIONS. Ashtrays provided. * ATV's, fishing gear, small fishing boats, hiking accessories or whatever you need for outdoor fun. I am Kristi Loggins, I am a registered nurse in the valley and my husband Jay has worked for SRP for nearly 20yrs. We have enjoyed many summers in Forest Lakes camping/hunting with our 2 daughters and 2 dogs. In 2017 we purchased our dream property which includes this cozy bunkhouse. We are truly excited to share the beauty of the White Mountains so that other families can make wonderful memories just as we have. It's close proximity to lakes, riding trails and wildlife. Perfect property to relax, unplug and unwind. This community offers events such as arts/craft fairs with homemade goodies, ATV poker runs, and antique shopping in nearby Heber. The bunkhouse was very pleasant to stay in. It’s small but comfortable and is nicely equipped. Be aware that it doesn’t have a dishwasher or a wood burning fireplace but other than that it is quite comfortable and worked very well for our family of three + our dog. I would not hesitate to stay here again. The owner is very pleasant and communicates quickly and clearly. Bunkhouse was very comfortable and clean. Location is beautiful with many lakes nearby. Hiking trails with beautiful vistas are also nearby! Sounds like you enjoyed some of the beauty Forest Lakes has to offer. Thank you for the review. We'd love to have you back! The bunkhouse is cozy and just the right size for our family of three, though it sleeps more. Space heaters kept us toasty overnight. Having access to the garage made it easy and safe to store our mountain bikes. The neighborhood was the perfect launch sight for our mountain bike adventure. The Forest Lakes trail-head was a short warm-up ride from the bunkhouse. We look forward to coming back in the summer so we can take full advantage of Forest Lakes and the surrounding national forest. Kristi was responsive to all my inquiries and I'd be happy to rent from her again! Thank you for the great review!! Sounds like a good trip. We are happy to have you back anytime! We really enjoyed our stay! We needed another cabin in Forest Lakes for cousin week. My mother stayed with my kids and I. She took the private room and we slept on the twin beds in the loft. Because there was a smart tv the whole family tended to gather at this cabin for meals and night cap movies. There was plenty of room for everyone and the fully stocked kitchen made cooking easy. We even celebrated 2 birthday's and we're able to make cupcakes and a cake. I also loved that we were able to open the garage and access the house from there. I don't like shoes in the house and everyone was able to leave their shoes outside of the house without leaving them outside or piled up inside the door. Thank you for the review. Sounds like a wonderful time!! We'd love to have you back! This cute little bunk house is even cuter in person. It was perfect for the three of us but could have easily been just as comfortable for a party of five. Kristie was very informative and responsive. Also, the cookies and cake were delicious!